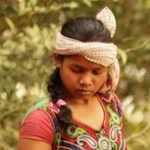 Night of Theatre n°11, the eleventh edition of an unusual night-long festival of contemporary performing and collaborative arts, took place on Saturday, March 2, 2019 at and around Trimukhi Cultural Centre in the Santhal tribal village of Borotalpada, West Bengal, India. Three French and South African artists (Guy-André Lagesse, Nicolas Barthélemy and Dorine Julien) from Les Pas Perdus, Marseille, a Japanese choreographer based in Bruxelles (Ikue Nakagawa) and the complete team of Trimukhi Platform (French Jean-Frédéric Chevallier, Bengali Sukla Bar and Santhal Bhudray Besra, Sumita Besra, Dani Hansda, Dhananjoy Hansda, Dulal Hansda, Falguni Hansda, Joba Hansda, Ramjit Hansda, Sukul Hansda, Salkhan Hansda, Surujmoni Hansda, Gurubhari Hembrom and more) prepared for the occasion in situ sound, dance and dance-theatre-video performances as well as gigantic art installations. 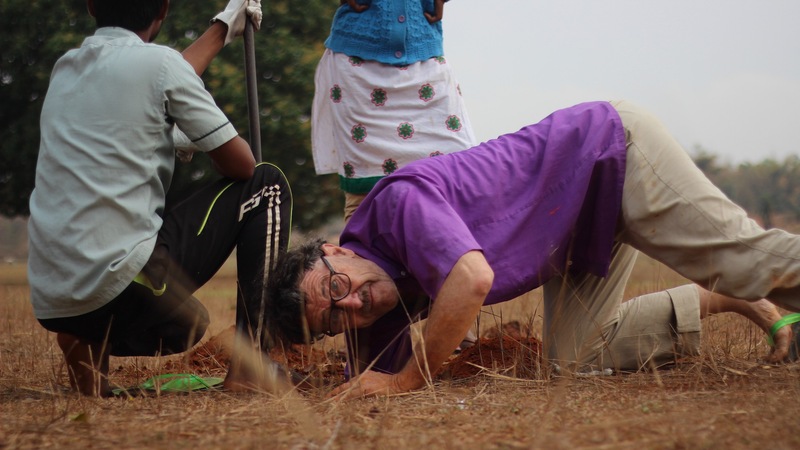 To make things different this year, the night of theatre began at day time: the audience was invited to a surprising afternoon walk through the village and the surrounding deforested forest (called for this occasion “the bonsai jungle”). As each year, the festivity ended with a multi-cultural dance party. For NIGHT OF THEATRE n°11, TRIMUKHI PLATFORM proposed three different kind of shows: one directed by Jean-Frédéric Chevallier with 12 dance-theatre performers from the team, investing a majestic mud house recently built in the village and using its façades for video art projections (titled: HOME MADE THEATRE); a sound installation designed by Sukul Hansda for a welcome ceremony (titled: JANGA DA SARÉ); Santhal dances performed by the village women coordinated by Falguni and Motilal Hansda (titled: BURU JATRA). Based in the city of Marseille, south of France and constituted by French and South African visual artists, LES PAS PERDUS is part of the collaborative contemporary art movement. Since 1994, in France and Africa, the collective builds art works with occasional artists, that is men and women who have a creative and sensitive relationship with their everyday life. There is no a priori as for the results: care and attention brought to each one and to every situation contribute to the sense of the work. The approach connected with everyday life leans on the dynamics of circumstances, improvisation and relationship, putting forward the ordinary as an inexhaustible poetical potential. One of the definitions of the word “work” is to “bring into play” … Forms follow. 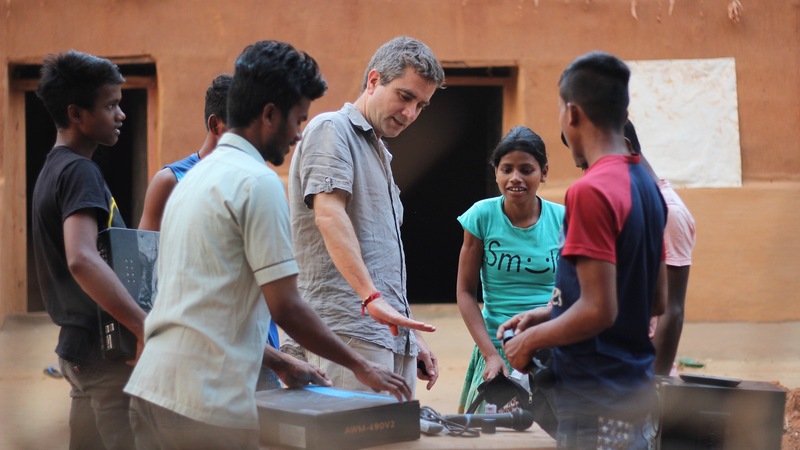 Guy-André Lagesse, founder and coordinator of the collective visited Borotalpada in November 2018 and explored the possibility that the village brings. 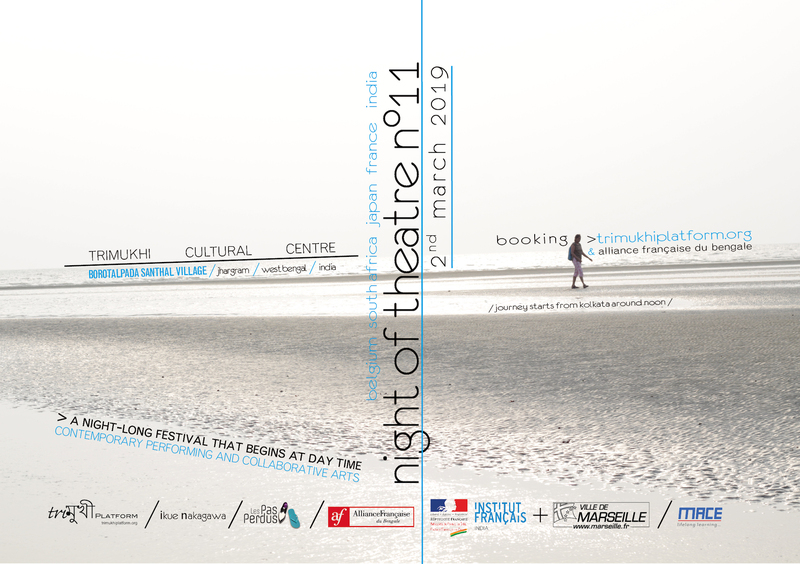 For NIGHT OF THEATRE n°11, Guy-André Lagesse is building, together with Trimukhi Platform team, two gigantic art installations: one along the street crossing the village (titled: THE FLIP FLOP AVENUE OF FANCY HEAD DRESSES) and one in the middle of the elephants corridor (titled: THE MIGHTY GIANT — A SLIGHT APPEARANCE). Born in Japan in 1980 and now living in Belgium, IKUE NAKAGAWA studied dance at Osaka University of Arts, then continued her training at the Choreographic Development Center of Toulouse in France. She worked with choreographer Frank Micheletti and theatre directorPascal Rambert during several years as well as with performance artists Morgan Nardi, Eun Yong Lee and Lorenzo De Angelis. After giving birth to two children, she came back to her field. That was last year, in Borotalpada village, on the occasion of the Night of Theatre n°10 where she participated in 4 dance performances. For NIGHT OF THEATRE n°11, IKUE NAKAGAWA goes deeper in her collaboration with Trimukhi Platform team: directing a multi-facets trio to be showcased in front of Trimukhi Cultural Centre with Salkhan Hansda, Ramjit Hansda and Joba Hansda (titled: YUTEN) and dancing for an unexpected performative intervention — designed by Jean-Frédéric Chevallier — in the middle of a “bonsai” jungle (titled: TYPOLOGY OF THE UNEXPECTEDNESS). After Night of Theatre n°11, Jean-Frédéric Chevallier (director of Trimukhi Platform) and Fabrice Plançon (director of Alliance Française du Bengale) invited Masayuki Taga (Consul General of Japan in Kolkata), Dorine Julien (France), Guy-André Lagesse (France, South Africa), Ikue Nakagawa (Japan, Belgium), Nicolas Barthélemy (France) and Nouman Malik (India) to tell the audience about their thought after their experience in Borotalpada village during the night-long festival. To share two extracts of what has happened few days before in Borotalpada village during Night of Theatre n°11, Ikue Nakagawa (Japan) performed a dance solo directed by Jean-Frédéric Chevallier while Guy-André Lagesse and Nicolas Barthélemy showcased some of the sculpture-installations Les Pas Perdus have for the occasion designed with the villagers. And, last but not least: to stimulate the production of thought, wine was offered by the General Consulate of France in Kolkata.